King of the Cage wrapped up yet another fight event and this time it was an all amateur show inside The Crowne Plaza Hotel. The “Future Legends 18” fight card was full of exciting fights, slick submissions and devastating knockouts. The amateur fighters delivered an outstanding night of fights for the fans in attendance and SWFight.com would like to take the time to award some unofficial post-fight props. In what ended up being the night’s most exciting bout, FIT NHB’s Charlie Williams showed his offensive and defensive talents throughout the three round-nine minute fight. While Veloz fought valiantly, he did so in defeat as Williams was able to capitalize in just about every area of the fight. Despite Williams taking every round on each of the Judge’s Scorecards; the fight was very competitive throughout as Veloz would mount his own offense in each round to make the fight worth roars they received in the bout’s conclusion. FIT NHB’s Charlie Williams was able to grind out three tough rounds en route to a Judge’s Decision. The story of the fight was the leg kicks and composure of Williams as the FIT NHB fighter stayed patient throughout the bout and diligently launched fight changing leg kicks at Veloz, connecting on the inside and outside of the lead leg. When the fight hit the mat, Williams stayed busy on top and worked very effectively reversing when he was put into bottom position. The fight showcased talent from both fighters and their technical display of skills were very impressive especially for the fans in attendance who appreciate the more in-depth aspects of MMA. Williams worked sweeps, Veloz attempted submissions and both fighters left it all inside the cage. Now 4-1, John Rozema has made his case for the need to turn professional. With five bouts to his name on the amateur level, Rozema has absolutely crushed his opposition with four knockout victories. The Judgement MMA fighter is on a tear and anybody who gets in the way of his powerful striking is leaving venue’s with a headache. 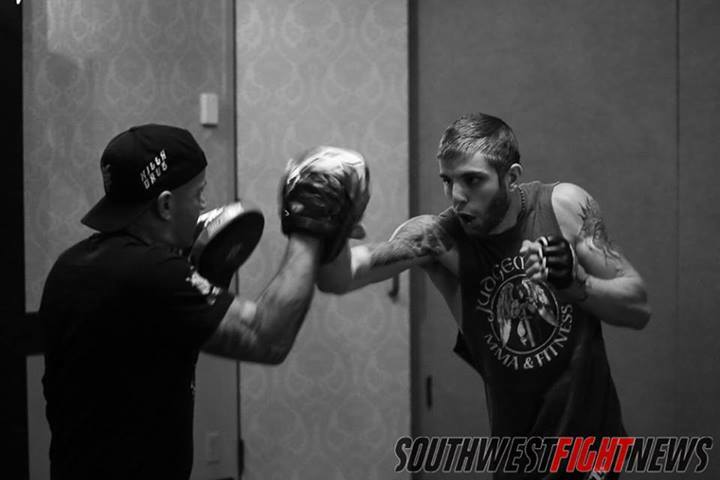 Rozema’s striking once again shines as he was able to finish another opponent by knockout. Unfortunately for Mike Aguilar, he was in the way of the Rozema knockout train. After an initial flurry, Aguilar first tried a flying guard-pull and than a takedown from the clinch. As most fighters have done against Rozema, they have tried to stay away from the power by grappling and Aguilar thought he was safe in close range along the fence. Rozema grabbed ahold of the collar-tie and launched a knee right into Aguilar’s face. It was a brutal fight ending knee that sent Aguilar flat to his back completely defenseless. Add this fight to the highlight reel of knockouts during his amateur tenure. The knee was masterfully placed and the win showed exactly why Rozema is on the way to the professional level. He is 18-years old and he cemented himself on a short list of amateur 125-pound fighters who have emerged as New Mexico’s top prospects. 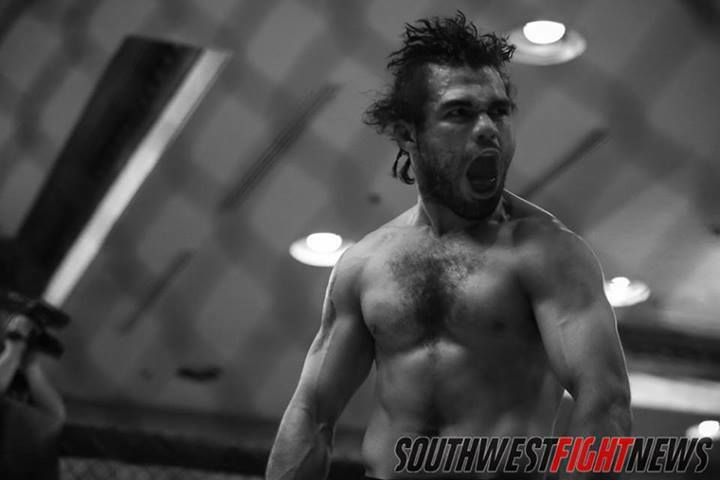 He is 3-0 and after a busy kickboxing and Muay Thai smoker run prior to his amateur MMA debut, Rivera can be officially slated as a “must-see” fighter. He is starting to have the feel of a fighter that may become a special fighter and fight fans can see him progress in the amateur ranks. Fighting off some early danger, Rivera was able to stay perfect as an amateur. 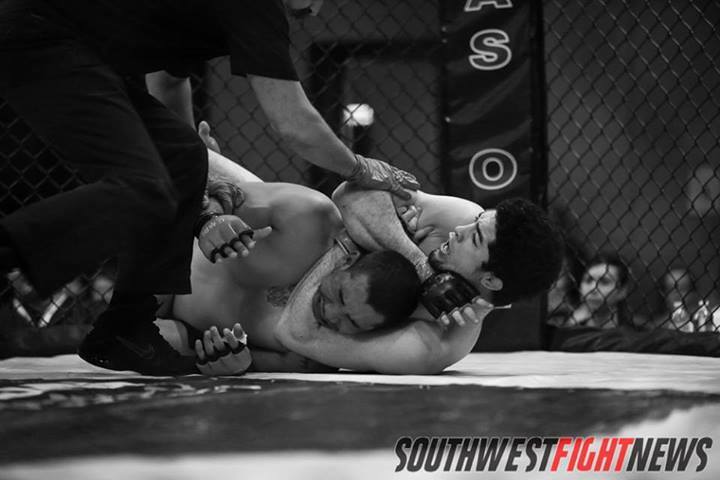 In his fight with the older and more experienced Joey Trevino, Rivera found himself caught inside a very deep standing guillotine choke. Trevino really applied some insanely powerful torque on the choke and the taller Rivera stood on his tip toes looking to avoid the pressure. Trevino made the mistake of tying up Rivera’s leg while choking which than allowed Rivera to get a trip takedown. Once on the mat, the heart of Rivera shined as he fought off the choke and immediately went to work ground and pounding Trevino. The mat work is what has been most impressive in Rivera’s three amateur bouts. Rivera would slip to the back of Trevino and quickly sunk in the fight ending choke. While the finish was out “Submission of the Night”, it is very interesting that Rivera’s three fights have ended via submission and he has yet to demonstrate his vaunted striking skills that the Judgement MMA team has talked heavily about. Wrestling and grappling championships are synonymous with the name Jess Martinez and last night we found out that behind all of his talent comes a huge fan base and following. Martinez entered his second amateur bout with a roar from the crowd suggesting that instead of an amateur, that Martinez was a full blown superstar. 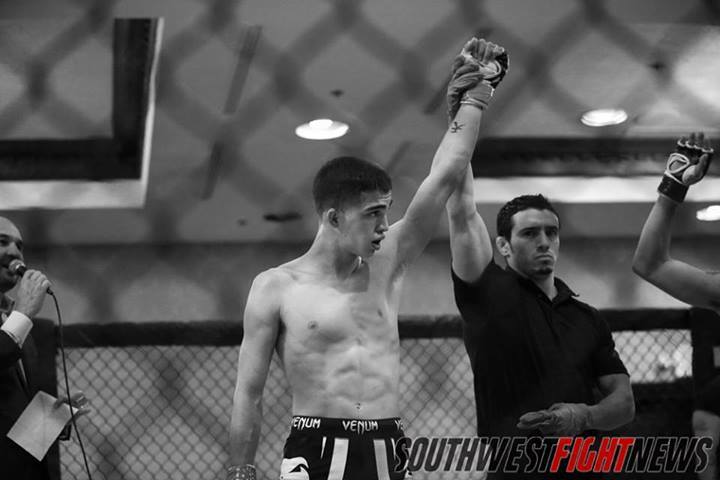 Showcasing the reputable grappling and wrestling skill, Martinez manhandled his opponent. Martinez showed impressive progression from his first bout as Martinez looked aggressive and dominant once the fight hit the mat. He took down Rodriguez several times with lateral throws, trips and a big time double leg. He was able to achieve mount and eventually back mount where he was able to lock in a rear-naked choke. The second the referee waved the fight as being over the crowd inside The Crowne Plaza Hotel roared and for a second the buzz inside that venue became reminiscent of the days when Angelo Sanchez main evented the Buffalo Thunder venue or when Holly Holm would pack the Route 66 Casino. Martinez may end up being a top prospect and if he does, he may be next New Mexico fighter to really haul in the ticket sales as he had a very impressive following for a two-fight amateur.